WITI's mission is to empower women to achieve unimagined possibilities and transformation through technology, leadership and economic prosperity. Not Yet a WITI Member? Make sure the address in the "From:" field EXACTLY MATCHES the address you wish to subscribe or unsubscribe. Plan now to attend WITI's 2004 Conference Series, "Moving Powerfully into the Future"! Coming to Houston, Texas, May 5 & 6 and to San Jose, California, June 8 & 9. More information and early registration now available online. Do you know people who always seem to be lucky in their career? They get the best jobs, the best promotions, the best salaries. Right? We all know people like that, but have you ever taken a critical look at why and how they became so "lucky?" Luck is when preparation meets opportunity! The Holiday Park Elementary School in Phoenix, AZ, has 50 fifth and sixth grade girls who want to attend the Sally Ride Science Club Festival held at Arizona State University, on Saturday, March 6th. However, the school only has funds enough to send 30 girls. Help keep these girls interested in technology, math and science! Join or renew your WITI membership for at least one year before February 20th, and a portion of your membership fees will go toward making sure all the Holiday Park students who want to go the to festival are able to attend. Many of us became so irritated by the whole "victim" story we encountered during the feminist movement that we have swung all the way to the other extreme, becoming defiant about the slightest suggestion of needing help or not having everything under control. Congratulations to WITI Member Hilve Firek on the publication of her book, 10 Easy Ways to Use Technology in the English Classroom! A resource for educators, the book offers how to ideas and instructions for bringing technological resources, from old familiars like audio and video to new developments like websites and concept mapping software, to the study and appreciation of literature. That girls drift away from scientific and technological pursuits during the middle and high school years is a well-documented phenomenon. Ms. Firek's book provides a way to increase girls' exposure to technology by bringing it into the language arts classroom, a place girls feel more comfortable, thus increasing the chances that technology itself will not remain a foreign language for female students. 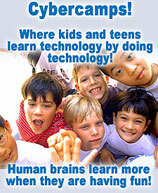 More information on 10 Easy Ways to Use Technology in the English Classroom is available on the publisher's website. And congratulations again to Hilve Firek! Do you have an announcement or promotion you'd like to share? Send your news to Carolyn to appear in "Women on the Move." Cybercamps hosts single and multi-week summer technology camps for 7-16 year old boys, girls and teens at prestigious university campuses across the US. A Cybercamps experience offers so much more than your average summer camp. We serve up the phenomenal fun of summer camp neatly hidden in a learning experience that inspires campers to pursue careers in tomorrow's hottest technology fields. Is your business in the WITI Marketplace? Do you have a special offer for WITI members or would you like to be a featured business in a future issue of the Strategist? We'd love to hear from you! Dice Inc., the leading job board for technology professionals, has released results of the Dice 2003 Annual Salary Survey. The survey of more than 21,000 technology professionals details key industry trends including the first narrowing of the gender gap since the survey originated in 2000, a recovery of salaries that were hit hardest last year and significant salary growth for entry-level technology workers. For the first time since Dice began conducting the salary survey in 2000, the gender gap decreased -- narrowing to 11% -- as women's salaries increased 5% to $62,800 and men's increased only 2%. Spending more time at the office helps -- women who reported working over 55 hours a week earned only 7.5% less than men. The gap also varied significantly by industry, as women's salaries ranged from 3% less than men's in the Internet services industry to 19% less in the medical and pharmaceutical fields. Save $700 off the regular/onsite fee ($1695) when you register using Promo Code SGTWTY. 65 of the best new products you won't see anywhere else. Top tier media reporting on every idea. Savvy VCs weighing every opportunity. Acquisitive corporations evaluating every move. Expertise you can count on. Technology picks you can't afford to miss. A special WITI Member Discount Rate is available; see the discounts page in the Member area for details! Women For Hire career expos: Make your next connection! Women For Hire career expos are great opportunities for women in technology to connect with companies such as Northrop Grumman, Lockheed Martin, Swales Aerospace, Siemans, Nextel Communications, Integic, General Dynamics, among dozens of others. The Women For Hire events will put you in touch with hundreds of technology positions! Free Admission for Jobseekers -- Resume and Business Attire Required -- No Pre-registration Necessary! Special for WITI members: Register today for our special early morning seminar prior to each career expo and receive a copy of our video, Women For Hire's Practical Path to Career Success, and priority admittance to the career fair. Present a copy of this email upon admittance and you'll receive a free Women For Hire Networking Notebook - an ideal place to store and build your professional contacts! Visit www.womenforhire.com today for full details and to register. Accelerate Your Career! - Companies that get it are searching the resume database at WITI4Hire every day. Don't be overlooked! So, whether you are actively seeking a job or just open to great possibilities, add your resume today (FREE for members AND non-members, and confidential too!) to be noticed by companies like New York Times Digital, Best Buy, Altiris, Southern California Edison and GOJO Industries, Inc. Don't want to wait? Visit WITI4Hire and search for your next job! If You Are Fed Up With Your Hosting Company or Just Want To Upgrade! - WITIhost.com has better rates, more capacity and better service than major hosting companies. Check out WITIhost.com for comparisons and fees. Since the National Conference will be in June, we have extended the deadline for nominations for this year's WITI Hall of Fame awards. Download and complete the nomination form today to recognize the women who are making a difference! Avanade (www.avanade.com) is an independent company that was created through a joint venture between Microsoft and Accenture in April 2000. We are the world's premier technology integrator for Microsoft solutions in the enterprise. We create value for our customers by leveraging Microsoft enterprise technology to design, build, and deploy customized, reliable architectures and scalable infrastructures to increase profitability, improve speed-to-market, and accelerate growth. Avanade is focused on helping Global 2000 customers, and our technology infrastructure and .NET application development solutions have underpinned hundreds of customer projects worldwide. Avanade is unique in the marketplace due to our unparalleled Microsoft technology skills. Our depth and breadth of competency in cutting-edge technologies is virtually unrivaled in the market. Whether you offer deep expertise in a single area or broad technical ability, your skills are paramount. And we will help you develop them further. At Avanade, we encourage all of our consultants to be Microsoft-certified within a year of hire, and we provide a range of technology learning opportunities. Search for Avanade jobs on WITI4Hire. HP is a leading global provider of products, technologies, solutions and services to consumers and business. The company's offerings span IT infrastructure, personal computing and access devices, global services, and imaging and printing. Our $4 billion annual R&D investment fuels the invention of products, solutions and new technologies so we can better serve customers and enter new markets. We invent, engineer and deliver technology solutions that drive business value, create social value and improve the lives of our customers. Marketing is more than blue-sky ideas. Marketing Principals provide the drive to make high impact, integrated communication campaigns happen for us, our business partners, and channel customers. You'll plan, create and deliver one-to-many business-to-business communications that sharpen our edge and increase our leadership. This will involve developing a wide range of media and marketing strategies that raise and reinforce brand awareness, as well as delivering consultancy support to other marketers to keep brand integrity intact. List your small business or consulting practice in the WITI Marketplace. Send/receive e-mails in WITI's general or technical listserves for invaluable and quick input on broad ranging issues. And much, much, more .... Become a Member Today! WITI @ ...Keeping you up-to-date on where you'll find WITI!